All of us at BraunAbility were shocked and saddened to learn yesterday of the death of Karl Beck, a loyal BraunAbility employee for 32 years. The news came to me just as I was editing one of his blog posts - fittingly enough, it was about a customer. 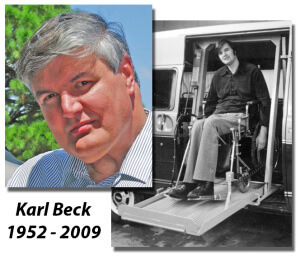 If you ever had the opportunity to spend time talking to Karl, you know that he truly cared about our customers and he enjoyed his job helping people change their lives with the help of adaptive technology. I'm happy I got to know Karl a little better this past year as we worked together on AbilityVoice. We've lost a valued contributor and friend. Here is his last story. "I Love My Braun Van!" Our customer Ron Johnson visited us at Braun Florida last week so we could do some repairs to his Toyota Rampvan. Ron is one of a handful of retail customers who still come to us for repairs. They provide our mechanics with invaluable "real world" repair experience that gets passed on to product support and engineering at our corporate headquarters in Winamac, Indiana. Their numbers are so few that we almost consider them part of the family. In Ron's case he would be the strange uncle who only comes to visit twice a year. Like he always does, Ron came in sarcastically yelling "I love my Braun van!" Our reply is "What did you do to it? It was fine when it left here six months ago." He's slowed down now, but in the past he was notoriously tough on his equipment. So when he bought his first Toyota Rampvan, loved it, and didn't come back for repairs for months and months, we called him to make sure he wasn't ill. Whenever Ron comes to visit we do some reminiscing about the past. I've known him since 1977 when he and I played on the same wheelchair basketball team. Despite his size and weightlifter's build he was a guard in basketball. He also ran track, did field events and for awhile was ranked as one of the top 10 wheelchair tennis players in the country. He can be boisterous and outgoing, which hides the fact that he has degrees in marketing and accounting, was a CPA, and can work the keys of a calculator so fast they practically dance. Early in 1984 Ron and I were sitting in a jet headed for a basketball tournament in Dallas, TX. Ron asked one of those million dollar questions that don't have an answer. "What does someone like us do when their van breaks down?" It is a question that is still relevant today. We addressed this question again late last year when, as part of our AbilityPlus dealer program, we asked our best dealers to have rental vans available in case a consumer has an immediate need for transportation. On that flight, Ron and I discussed the expenses and issues involved in starting a van rental business and a few months later, Ron and his brother Doug started renting Ford vans with lifts. Unfortunately, not enough people were renting vans, partly because the customers were unsure of what they were getting. Today, rentals work because of the more universal design of the lowered floor minivan. But, Ron and Doug had people practically begging them for trips to the store, doctor, and everywhere else. They renamed their business Care Ride and started providing door-to-door transportation for persons in wheelchairs. Although Ron retired many years ago, Care Ride LLC is still in business, almost 25 years later, and has dozens of wheelchair vans, all of which are equipped with Braun Millennium wheelchair lifts. Over the years they have provided trips to work, college, medical treatments, nursing homes and many other places to thousands of residents of St. Petersburg and Clearwater, Fla.
Care Ride exemplifies our old slogan "providing access to the world." Every day they provide access for their customers to the parts of the world they need to visit.We are proud to assist them with repairs and information and to be a small part of their success. In fact, we are so proud that we'll even fix Ron's Toyota the next time he breaks it.